If you have been a Fermilab user and need to renew your cmslpc account (and Fermilab credentials), read the full directions for Fermilab account renewals. you will fill out this account renewal form. Fermilab contact name (first and last): A senior member at your home institution who has an active Fermilab badge. This person can be the same as your Institution contact and does not need to be a Fermilab employee. After the application is submitted, you may be contacted to provide more information. That includes, but is not limited to a requirement from the DOE: "Effective February 1, 2019, all non-U.S. citizens who request new (or renewed) onsite or remote access may require the submission of a curriculum vitae (CV)/resume". A CV/resume template is available, or you can use your own that meets the requirements given on the template. 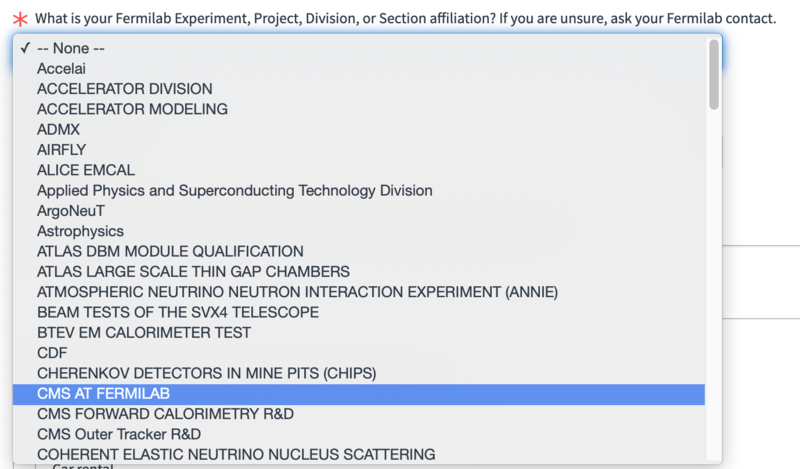 Note that if you are changing experiments at Fermilab to CMS, you will need to put in a new cmslpc account request to create a cmslpc account for you after your FNAL credentials are renewed. Just choosing E-892/919 (CMS) as the experiment for a Fermilab renewal if you did NOT have a cmslpc account before will not have a new cmslpc account created for you. If you have changed institute, please contact the Fermilab Users Office to assist in getting the information changed at Fermilab. Note: Your EOS area is created but cannot be written to by CRAB (T3_US_FNALLPC), unless you provided your grid certificate (and CERN username) upon account application or renewal. After account is created: follow directions at the Using EOS at the LPC page to get your grid certificate linked to your T3_US_FNALLPC EOS area. U.S. CMS is supported by the U.S. Department of Energy and the National Science Foundation.